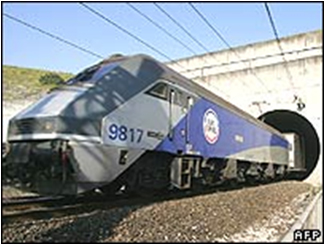 The Channel Tunnel (or Chunnel) connects the United Kingdom with France. It is actually a set of three tunnels, over 31 miles long, that pass beneath the seabed of the English Channel. Because of the huge amount of road and rail traffic at the large terminals at each end of the tunnels, a road-weather information system (RWIS) is critical for safety and efficiency. An ice-warning system had been in use for 15 years, and had become so obsolete that it could not be upgraded. In addition, the old system was so unfriendly that the operators rarely used it, so user-friendliness was a key requirement for the new system. Eurotunnel, which owns and operates the Channel Tunnel, awarded a contract for an entirely new system to the team of Campbell Scientific Ltd. (CSL, Campbell Scientific's affiliate in Europe) and Weather Services International. CSL designed and installed a replacement hardware and software system, named IceWatch, to be user friendly and appealing to the operators tasked with the safety of the facilities. The system includes seven automated weather stations (AWS), a server and multiple displays at the terminal in each country, and documentation and training. Six of the AWSs were set up with RWIS features, including IRS21 road surface sensors from Lufft and infrared road surface sensors. Precipitation type is classified by present-weather sensors. RTMC Pro software from Campbell Scientific was used to design and control the data displays, including showing data from two different sources. CSL set up the system so that the operators at the terminals in both the UK and France could see the weather and road-condition data from both countries. With the IceWatch system, the Eurotunnel staff now has state-of-the-art equipment and displays to quickly and clearly show them the road and weather conditions at their terminals. They can make informed operational decisions to maintain site safety and reduce costly disruption.